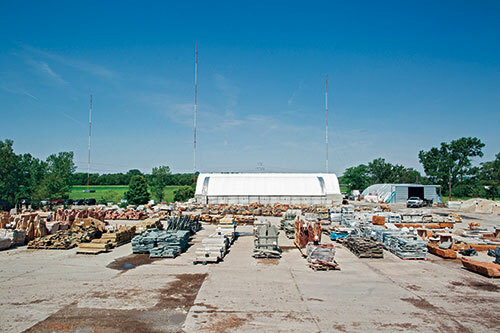 Establishing a purpose and values—and living by them—drives growth at Sun Valley Landscaping. Paul Fraynd and Hugh Morton have a challenge on their hands. They want to hire a best-in-class staff so they can grow their company. At the same time, they need to expand their operation to attract great people. Some might call it a paradox. Others would say it’s growing pains. 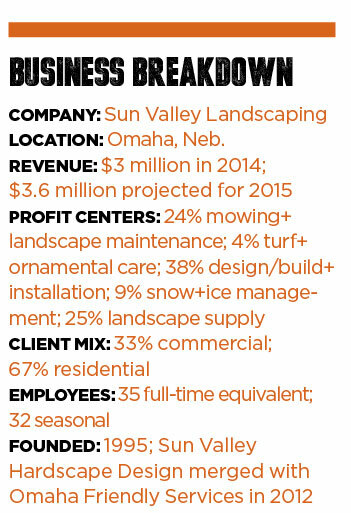 Whatever you call it, the owners of Omaha, Neb.-based Sun Valley Landscaping aren’t letting it slow them down. They’ve grown their company about 25 percent per year since merging their two firms in 2012. And they plan to double in size by 2018, despite their people challenge. With a company purpose and set of core values driving everything they do, the Sun Valley Landscaping owners are proving they’re committed to their staff, clients and community, and it’s paying off. During his freshman year at Creighton University, Fraynd and his roommate started a business to provide maintenance services, including lawn mowing, with a $50 garage sale mower. It was the ultimate business school lesson for the budding entrepreneur. “I got a lot of out my education and my business by doing them at the same time,” Fraynd says. In 2002, he officially founded Omaha Friendly Services, and after graduation in 2003, his business blossomed with the help of his father as a partner. After five years, it was generating about $1 million in annual revenue. Meanwhile, Morton, a Utah State University engineering grad, had discovered his passion: landscape design and installation. After working for a landscape firm in Omaha for about a year after graduating in 1995, he hooked up with Don Shrack, a local businessman with about 5 acres on his hands. 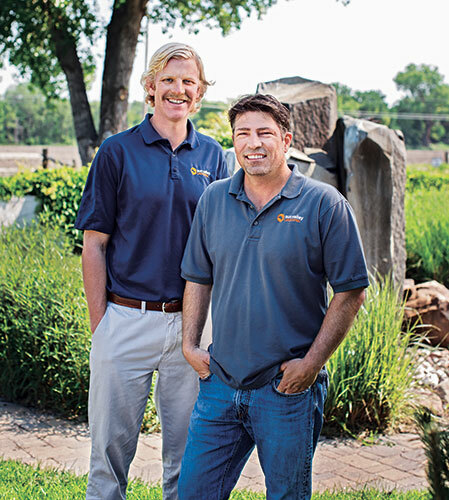 The pair started up a landscape supply yard and design/build business, called Sun Valley Hardscape Design, on the site of Sun Valley Landscaping’s current home. Sun Valley suffered a loss when Shrack died in 2006. At the time, the business was doing about $1 million in revenue. His top prospect was Fraynd. The pair had developed a rapport over the years. Morton was a supplier to Fraynd, and they subcontracted services to each other from time to time. Over the years, Morton came to appreciate Fraynd’s business acumen, and Fraynd was impressed by Morton’s technical expertise and experience. “For growth, I knew I had to take a stronger role in landscape design and installation and in the people,” Morton says. After his partner’s passing, he was too bogged down by running every other aspect of a small business. Those details, it turns out, are Fraynd’s specialty, so Morton approached him about merging. The merger took about two years, as they worked out details small and large, such as name, roles, how to buy out Fraynd’s father and more. By that time, Omaha Friendly Services was grossing about $2 million per year. It was growing fast but not making a ton of profits. Sun Valley, on the other hand, had healthy profits but was stagnant size-wise. The time was right, and the men recognized they shared a vision, values and interest. Not to mention, each business served a different niche. Together, they made a full-service firm. Today, the partners have their roles distinctly defined, with Fraynd overseeing sales/marketing, finance, human resources and the maintenance division. Morton runs the design/build division, manages the design team and heads up the supply yard. Although the company retained the Sun Valley name from Morton’s original enterprise, it was a new company and a new culture. To ensure they were on the same page as they rebranded, Morton and Fraynd turned to the one-page strategic plan concept from the book “Mastering the Rockefeller Habits” by Verne Harnish. Fraynd got the idea to use this tool from his brother, who had success with it in his job turning around public schools. This exercise prompted the partners to lay out a set of goals the company is now striving to meet. For starters, Sun Valley plans to double in size by 2018, reaching $6 million in sales. The firm’s “big hairy audacious goal” is to some day be considered a top landscape company in Omaha, a model for the industry and a destination company employing 50 full-time team members. Putting these things down on paper is “eye opening,” Fraynd says, explaining that doubling in size will mean going from 13 to 30 managers and having around 30 trucks. Specifying the goals forced the company to map out how it would achieve long-term objectives versus getting caught up in day-to-day details. “That’s what we’ve been focusing on: Changing our perception from a short-term, head-down, get-through-the-season mentality to ‘How are we going to get there?’” Fraynd says. One way Sun Valley is doing so is by breaking its larger goals up into smaller targets. For example, it’s in the midst of a baseball-themed contest to motivate the staff to gross $417,000 during June and July. The goal is tacked up on the wall, and financial progress is visible to everyone who wants to see it, as Sun Valley is an open-book operation. Many companies have mission statements or values, but the key for Sun Valley, Fraynd says, is talking about them, actually believing them and “using them to teach” the team. The first year after the merger, there was a lot of “we” and “they,” Fraynd acknowledges. “Once we put this stuff in place, it was ‘The Sun Valley Way,’ and we’re all in this together,” he says. “When you see the guys using the values to answer questions, the business tends to run itself,” Morton says. That brings us back to the Sun Valley “people” predicament: needing great people to grow and needing growth to attract great people. Culture is just one way Fraynd and Morton make sure they’re hiring the best. Other tools they’ve implemented to attract and keep top performers—defined as “people who can do great work without being supervised”—include a structured hiring process, Winslow personality profiles and a stepped up recruiting process. Sun Valley is always advertising its career opportunities, and Fraynd interviews an average of one person per day. One thing that’s not negotiable, when it comes to hiring, is an employee’s passion for the outdoors. “If they fit our values and have that passion, that’s what we’re looking for,” Fraynd says. He adds that he’s changed his thinking about hiring people with industry experience. For example, the company’s production manager had no prior industry experience, although he was a proven leader. 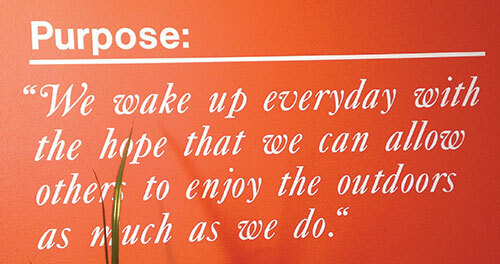 At Sun Valley Landscaping, the leadership team talks a lot about the company’s core values and purpose. But they don’t just talk. They use these tools throughout the company to help staff members make decisions. They discuss them at every team meeting. They’re displayed on the office wall. They are as follows. Core Values: “People come first. We do it right (the right way). “They’re our promise to our employees, the community and our clients,” Fraynd says. When the Sun Valley Landscaping owners and Director of Business Development Ashly Neneman realized 2015 was the company’s 20th anniversary, they wanted to do something big. They were inspired by a conversation they had last fall at a dinner at the GIE+EXPO trade show in Louisville, Ky., where several of their peers were discussing how individual companies can help raise the profile of the green industry. Their conclusion? Landscape companies can elevate the entire industry by being leaders in their own communities. That same week, several Sun Valley staff members were participating in a service project back in Omaha. They texted Neneman and co-owner Paul Fraynd photos of their work, sharing their pride and how much fun they had. 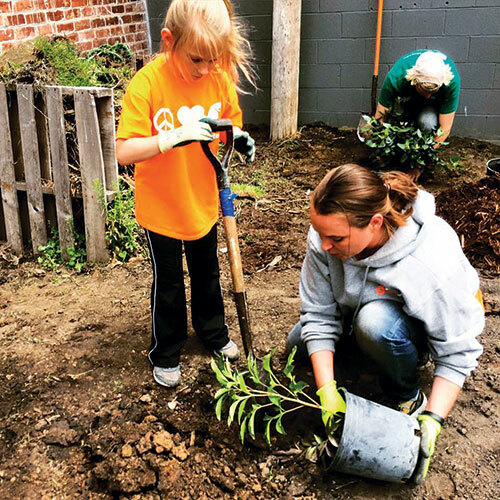 Not long after, Neneman came up with the Commit20 concept to challenge employees to volunteer 20 hours of their time to causes of their choice to celebrate the company’s milestone anniversary. The company took the concept a step further and extended the challenge to clients, partners and the entire Omaha community. The program quickly became a lot of work, so Sun Valley brought on an intern to help manage the website, social media and other details surrounding the campaign. No surprise, Sun Valley set an ambitious goal of getting 500 people to donate 20 hours each for a total of 10,000 volunteer hours by the end of the year. Neneman would really like to see the campaign hit its goal of 10,000 hours logged. 1 Comment on "Committed to the core"
Seems like a rather interesting story but unfortunately it’s not a successful venture to build a business to nearly $2 million dollars in revenue but “not making a ton of profits.” The free market has a keen ability to take advantage of the low ball services.